In my efforts to get more creative with my cooking, I discovered the term Sous Vide. I had no clue what that meant, but reading that the cooking technique produces restaurant quality foods, I was intrigued. I learned that it uses precise temperature control so that the food is cooked evenly and consistently. Sous Vide means “under vacuum” in French. In the case of cooking, the food is placed in a vacuum sealed bag and then cooked at a precise temperature in a warm bath. The author, Chris McDonald, believes that Sous Vide cooking is, “about the physics of applying heat to food.” The more control you have over the heat, the better the results. 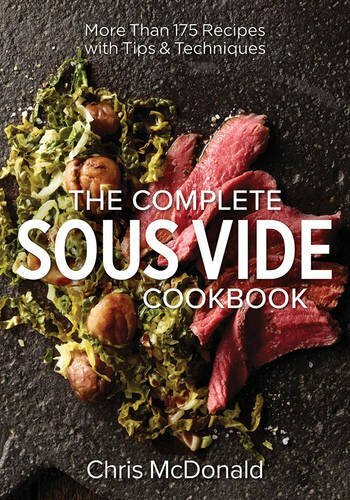 “The Complete Sous Vide Cookbook” contains 175 recipes that are derived from all over the world. These dishes include: meat; poultry; fish; seafood; vegetables; eggs; and desserts. Each dish offers a recipe with two forms of measurement including metric, a nice description of the plate, tips, and well-organized directions. There are also some pictures included, but I wish there were more. Fortunately, there are pictures included for three recipes that I was most curious about. I had no clue what they would look like! These are the recipes for Barigoule of Artichokes, Aloo Gobi and Chawanmushi. Very exotic to me, however, after seeing their pictures, I was even more interested in trying them. The sous vide device can also be used in place of other kitchen appliances such as the slow cooker. While I wouldn’t get rid of my slow cooker, I like the idea of having an additional appliance, so that I can run two recipes at once. The author covers several types of equipment needed. This is helpful since this is all new to me. Since I live in an area that would not have these devices, I was pleased to find them online. A good portion of the recipes contain animal products; however, vegetarians and vegans will find recipes to suit their needs such as Cashew Portobello Mushrooms which sound amazing! There are other recipes that can be adapted, such as Caponata, just leave the anchovies out. I am amazed at all the choices. They are not something that you would easily find in a restaurant in areas with less culture, such as where I live! “The Complete Sous Vide Cookbook” by Chris McDonald will work for cooks at all levels, from amateur to expert. Some of the ingredients might not be easy to find, however, I know that many of them can be ordered online, so it can be done. You will stand out as an exceptional cook after mastering the art of Sous Vide!